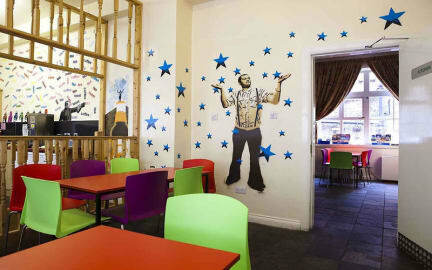 Great location, the room is bright and clean, public areas are tidy and spacious, the staffs are very friendly. This place was fine. Nothing special. The wifi only worked in the common room, and even then it was terrible quality. The showers were very nice, but the toilets could have used some work. The whole time I stayed there was no soap in one of the bathrooms. The room I stayed in also seemed damp, when I hung my towel to dry overnight I woke up with it more wet than it had started out as. The air here was dead, there was no any possible communication in lounge, it seems everyone don't have interest to talk. Our room is dark, and there are many famous persons' faces printing on the walls of this hostel, I think they want to make it funny or something but it turns out quite scary, I don't like to walk in the building alone at night, so did my wife. Bathroom is far from our living room unfortunately. The staffs are really helpful and nice, I like them.